Wooden Rustic Dark Blue Ship Wheel Knot Faced Clock 12"
The Wooden Rustic Dark Blue Ship Wheel Knot Faced Clock 12" is one of our most popular decortive clocks. 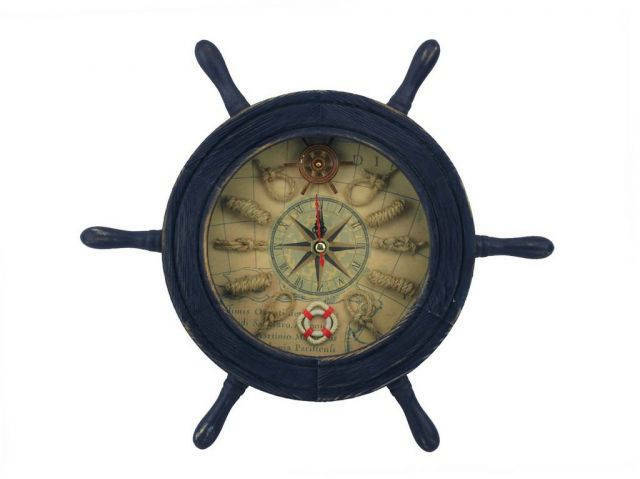 Classy and functional, this piece is sure to turn your space into a daring adventure.,The clock is approximately 5-inches in diameter and rests perfectly inside the ship wheel. This strong solid wood wheel also features a D ring hanging hinge on the back for easy placement and mounting.